In a change in policy, the Union government has approved a 4,000-acre site for Chennai’s second airport at Sriperumbudur, an hour’s drive from the city centre. The Dravida Munnetra Kazhagam (DMK) party, which runs the Tamil Nadu government and is a key ally in the Congress-led United Progressive Alliance government at the Centre, had proposedthe site. 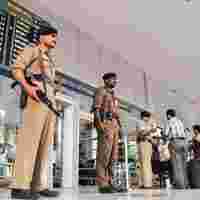 The government has also approved a plan to upgrade the current Chennai airport, at Meenambakkam, at an estimated cost of betweenRs1,700 crore and Rs2,000 crore. Bids for modernizing the airport, run by the Airports Authority of India (AAI), are likely to be invited by January, and awarded on a turnkey basis rather than splitting the contract between multiple engineering firms. The civil aviation ministry had so far believed growing air traffic at Chennai could be accommodated by upgrading the existing airport. Chennai’s Anna International Airport, spread over 1,152 acres, is India’s third largest by air traffic and traffic is growing at 17.3% annually. At that rate and amid a paucity of land to expand operations, the government now believes Chennai will need a second airport. The airport, which handled 8.7 million passengers in 2006-07, is likely to reach its saturation capacity of nine million this year. “We have asked them (the state government) to freeze the land so that whenever it has to be started (the process for second airport), we don’t face a similar problem," said civil aviation secretary Ashok Chawla, referring to illegal encroachments that have hampered expansion at airports elsewhere in the country. The latest Sriperumbudur site is the fifth that the state government has zeroed in on after the idea for a second airport in Chennai was floated a decade ago. Feasibility studies of the site still need to beundertaken. The state government has been asked to examine a plan to connect the site, which falls on the Chennai-Bangalore highway to Bangalore, to the city through an expressway that can handle high-speed road traffic. The highway is already clogged as Sriperumbudur is home to many automotive and other industries. “At the end of the day, (for) a city of this size, two airports should make sense," says Nand Kumar, an analyst with Fitch Ratings. But, given the huge costs involved, it would work best if work started on the existing airport “leaving (the new one) for a later date". The state government has said the new airport will be built by the AAI. Expanding the Meenambakkam airport could, however, face trouble since it will require over 1,000-acre land to build a second parallel runway. Much of this required land, pockets of which are inhabited by local residents, has still not been handed over by the state government, delaying the airport modernization. The state government has said it will be able to acquire about 300 acres, which is located ahead of a cross-runway at the airport and can be used to extend it further. A cross-runway is shorter than the main runway and bisects it at one end, and can be used for takeoffs or landing in tandem with the main runway. But an expert said simultaneous operations of both the main runway and the cross-runway (one for landing and the other for takeoff) may not work well. “Normally when the main runway has been blocked due to an accident or something, then you use the cross-runway," said Gurcharan Bhatura, the AAI’s former executive director (operations), who has studied the Chennai airport. The model, he said, was not working well at the Mumbai airport because “there is so much pressure (on Air Traffic Controllers) that even in a minor mismatch, there (is) a sound collision chance," he said.